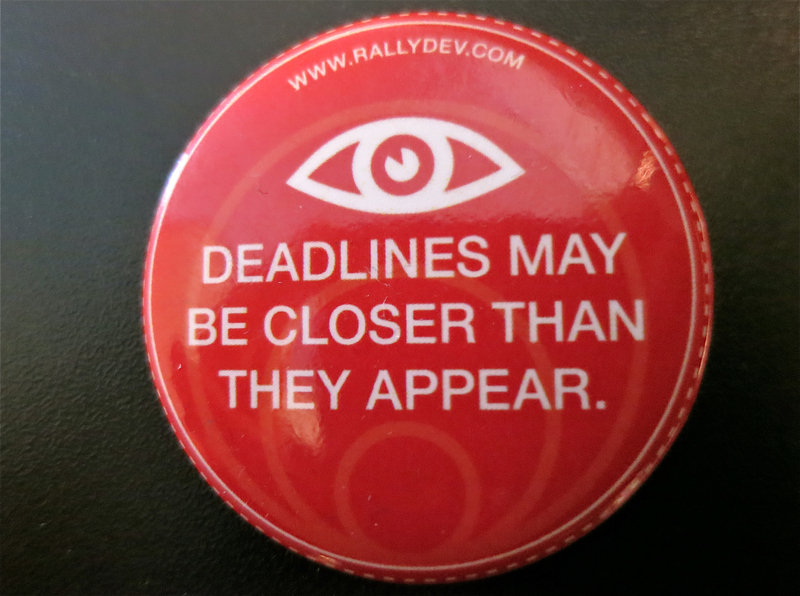 Love this button from the great folks at Rally Software. Does this seem familiar? Months before a deadline, the team is relaxed and responds to problems with: “Don’t worry! We’ve got months to deal with that!” As months turn into weeks, issues get addressed along the way, but some of the really hard problems continue to hang around. Finally, when the deadline is days away, pressure is on, and the team rushes to deal with everything at once, complaining that the deadline is the problem. It seems that our relationship with deadlines depends on our distance from them. When they are far away, they aren’t real so we just go with the flow. Once those deadlines are staring us in the face, our relationship changes. They pressure us into action. We hate the reality of the deadline but there is some part of us that loves the adrenaline rush. Certainly nothing beats the excitement and satisfaction we get when we work hard, hit that deadline and ship something that makes us proud! As a good leader or project manager, what can you do to ensure that issues are dealt with sooner and that deadlines do not whoosh by? Find the right, regular frequency. One of the core principles of Scrum is to set sprints that are always the same length. Even if you do not use Agile practices, it is still a good concept. Sprints or deadlines need to be long enough to get work done, but short enough to respond to change. Scrum recommends 4 week sprints. Shorter than 2 weeks is too frequent and longer than 6 weeks is too long. Keeping the length of the sprints consistent will help you and your team to develop a rhythm and better manage your time. When the deadlines are predictable, your ability to deliver will also become more predictable. Deadlines need to be meaningful to the team. This can be challenging, especially for Scrum teams. With regular sprints the deadlines are set for the sake of having deadlines. Unless the team really buys into the concept of delivering something every sprint, they will have a hard time finishing their work and the story at the top of this post will become all too familiar. Talk to your team and find out what motivates them to meet a deadline. Find ways to tie it to a bigger objective, such as an external demo, a trade show, a real customer release, a significant achievement in the development of the product. If it takes three sprints to meet such an objective, show the team how each deadline will get them there. Keep progress visible. You can easily lose sight of a deadline when you don’t know where you are on the journey. It’s like being in the back of a car on a road trip and you’re wondering: “Are we there yet?” Come up with a simple visual management system that clearly shows the team the goal and where they are on the road to meeting that goal. Put up a diagram of the major components that need to be developed and update it as each piece is worked on and completed. Add a countdown of how many days to the deadline and the team knows exactly where they are at and how far the deadline is. Stick to it! No one is going to take deadlines seriously if you move them. If you see that the team is in trouble, it should prompt you to make decisions about priorities, scope and resources, not to move the deadline. Never make the deadline shorter except under extreme and very real circumstances. If there is a strong business reason to do that, there must be real risk and reward attached to it, otherwise you will lose all credibility. Along the same lines, if the team misses a deadline, there needs to be real consequences. If the team beats a deadline, take some time to celebrate. Even better – give the team some free time before the start of the next sprint. What are your tips and tricks for helping your teams manage and meet their deadlines? How do you make them meaningful? How do you show progress? Please share your experience in the comments. ← Want To Reduce Stress? Embrace Reality! Absolutely correct. I am workıng wıth a team now that wants me to stay for 9 months. 3 months ıs about rıght for what they need so more than that wıll mean that progress happens too slowly and people do not do what they need to do today. Thıs translates to lost opportunıty. One of the most common complaints that clients have about freelancers is that they’re not reliable. What is this complaint based on? You can bet that missed deadlines had something to do with it. The project took twice as long to complete. Or you met the deadline, but it wasn’t tested for bugs. Perhaps this complaint was due something simple like failing to reply to an email in a timely fashion. These are all variations on the same key element of reliability . That is the ability to deliver a finished product, on time, every time.